We’re pleased to offer online scheduling through our client portal – Therabooks – so you can schedule at your convenience. Before you schedule, please read through the simple steps below (or have them up in a separate window) to have the best scheduling experience. If you want help choosing the best therapist, call our Care Coordinator any time. 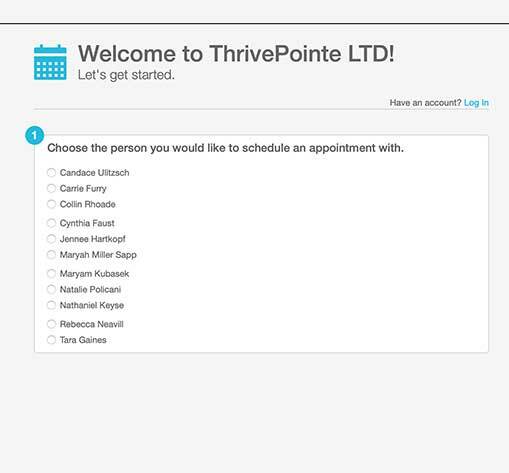 If you’re an existing client and want to manage your appointments online, log into the client portal. ThrivePointe has multiple locations to best support the region. You can either select the location that’s closest to you, or you can find each therapist’s location at the bottom of their page. Select the type of service you’re looking for to narrow down your options. NOTE: While we try hard to pair you with your preferred therapist, we may need to explore other options based each therapist’s availability and expertise. Don’t worry, it will be a conversation…no surprises. Once you’ve found the perfect therapist, launch Therabooks in a new window by selecting the button below. After you select your desired therapist, next you’ll be asked to select a service. If this is your first time, please select, “First Visit.” For all others, use your best judgement, we can always change it after a conversation. Wait, I don’t see my therapist! What does that mean? That means this therapist’s schedule is mostly full or does not offer scheduling through the client portal. Feel free to call the therapist directly or our Care Coordinator to talk through your options. Our therapists work varied schedules so for now, just mark the day and time that works best for you and we’ll give you a call to work out the details. You will hear back from the therapist to confirm this appointment and check in about what to expect in the first session. We do not offer same day online scheduling but you can always call our Care Coordinator to make the request: 833-914-4688. That’s it. We look forward to working with you.